Straightening up from the gunwale, the Indian caught Grey’s eye and smiled. This made the soldiers from the boat all laugh, and the Indian, still smiling, turned to them. Return to the webpage for SEVEN STONES TO STAND OR FALL. This excerpt was featured in Diana’s blog post of June 7, 2017. 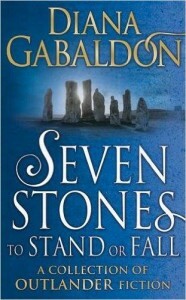 The cover image shown is from the U.K. hardcover edition of SEVEN STONES. This webpage was last updated on June 7, 2017 at 2:45 a.m. (PT) by Diana’s Webmistress.